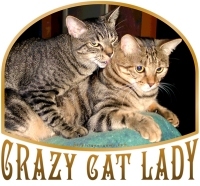 This “Crazy Cat Lady” design features a compromising photo of two of our felines going at… er, something! We’re not quite sure what – he and she are both fixed! Get this fun image now for your favorite feline lovin’ gal on a shirt, hoodie, tote bag, mug, clock or other fine giftware or apparel item. Also be sure to check out our other Crazy Cat Lady themed design, or if you like this picture, it is also used in our Real Men Love Cats design.